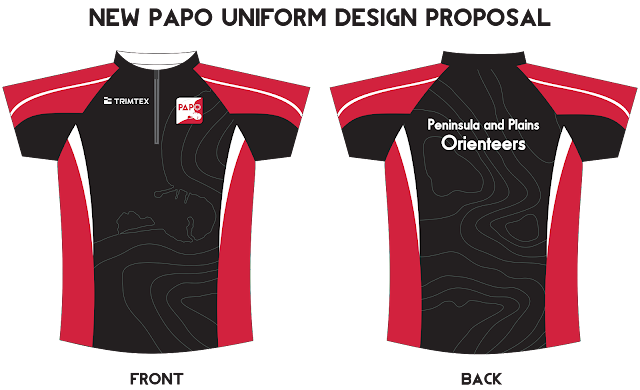 After an initial brainstorming session with many of the younger members of the Peninsula and Plains Orienteering Club I started putting together some designs based on ideas that came out of this. From there I got everyone to provide input as to what they thought worked and what didn't. The idea of a simple black, red and white design based around the traditional Canterbury region colours (but with a more crimson take on the red especially when printed on fabric) came out of this. I then refined the design and presented our proposal to the club committee for final approval before the design was sent off to Trimtex to be made. In the end the club were very happy with the final outcome and it's quite exciting to see members running at events wearing these tops. At the same time I was also re-designing the club logo. I knew that the committee was quite attached to the old logo so rather than create a completely new look I went with the idea of a modernised version of the current logo using the new colours of red, white and black.